Gov. Abercrombie visited Maui to launch a new Elementary School. He stopped by Tasty Crust in Wailuku and greeted diners. This entry was posted in Neil Abercrombie on September 9, 2011 by Maui Democrats. This entry was posted in Neil Abercrombie on May 13, 2011 by Maui Democrats. We started this legislative session by laying out a bold plan to move Hawaii in a new direction. We were determined to conduct ourselves with a spirit of collaboration. We said repeatedly that everyone must contribute and that our decisions must reflect our values and priorities. We have found that support for the political status quo, abetted by private interests, remains strongly in place. It will take time and action by the executive to change this culture. While we did not get all we wanted in this legislative session, we have made meaningful strides forward. We moved the Board of Education from an elected body to an appointed body embraced enthusiastically by the public. The Board of Education, comprised of diverse community leaders, has already begun moving our schools in a new direction. We signed a civil unions bill that ensures equal rights for all people of Hawaii. We did this without recreating the heated battle lines of the past. We secured private funding to transform the state’s antiquated technology system so we can streamline government services and save taxpayers millions of dollars. The people of Hawaii don’t want to hear excuses and arguments about why things can’t be done. They want action. Our administration will take the budget we have and transform government as we know it by being innovative, resourceful and relentless in the face of our challenges. In the coming weeks and months, you will hear of more partnerships and initiatives to move toward the New Day plan—educational excellence, energy independence and a sustainable economy. My administration is ready and moving; our community partners are ready, and the people of Hawaii are ready to bring positive change. There is no doubt in my mind that, together, Hawaii is on the way to a New Day. This entry was posted in Neil Abercrombie on May 5, 2011 by Maui Democrats. This entry was posted in Neil Abercrombie on April 20, 2011 by Maui Democrats. The Maui News publisher used his bully pulpit (“Pathetic excuse for leadership,” March 31) to criticize our new governor with no substantive or thoughtful insights to elevate the discussion. The publisher even went as far as wishing Linda Lingle were back as governor, when it was Lingle who got us into the mess we’re in and leaving it to Gov. Neil Abercrombie to fix. Under Lingle, the state defunded our children’s education, furloughed our workers, created an immense backlog of much-needed repair and maintenance to our infrastructure, crippled our agricultural inspection system and much more. Furthermore, Lingle delayed state tax refunds, leaving $200 million that the state owed under her administration for this administration to pay. Abercrombie is trying to fix these problems, but it will take time. Abercrombie is taking measured, sensible and reasonable action. He’s already made some tough choices, including cutting social services programs because it relied on federal funding that ended under the Lingle administration. * Partnerships with community groups and organizations to develop methods to combat invasive insects and diseases, including those attacking Hawaii’s coffee and bee industries. * Ending outsourcing contracts in the Health and Human Services departments, saving the state millions of dollars and putting these extra responsibilities on state employees. * Ending furloughs for employees paid for by federal and special funds, thus providing more services for the public. Abercrombie is showing leadership. He has laid out his plan, and now he’ll work with the state Legislature on other proposals put forward. That’s how the legislative process works, which the publisher seems not to understand. It’s easy to criticize and blame others, but that does not help the people of Hawaii. The choice in solving Hawaii’s fiscal challenges does not come down to merely increasing the general excise tax or cutting government. It’s clear that neither of those two choices alone solve our state problems in the short or long term. * Lance Holter is chairman of the Maui Democratic Party and lives in Paia. This entry was posted in Neil Abercrombie on April 11, 2011 by Maui Democrats. Tomorrow morning Apr 6th from 7:06 – 8:00 am, Governor Abercrombie will be on the radio taking calls from all. It would be great if he heard from you rather than the lunatic fringe who seem to revel in writing negative letters to The Maui News. The broadcast channel is KAOI, 1110 AM on your radio dial. The call-in number is 242-7800. Let’s call in with our own comments/questions. This entry was posted in Neil Abercrombie on April 5, 2011 by Maui Democrats. Since becoming Governor, I have assembled a team of talented and dedicated public servants to lead our sixteen state departments–and I have been working to formulate a fair and balanced approach to the challenges facing our state. Yesterday, in my first State of the State address, I presented a plan that will balance the budget, speed up our recovery, result in increased revenues and create a healthy, functioning government. Although our goal is to present ideas that are well considered and developed–products of conversations with lawmakers, academics, private businesses, workers, nonprofits, and community leaders–I am wide open to other ideas. I want to hear from you. Don’t hesitate to send me your comments, ideas, and concerns. As I’ve said many times, the challenge before us is not to balance a budget. Our challenge is to ensure that our values and priorities are reflected in the decisions we make and actions we take. I am asking every person—each legislator, administrator, business owner, worker, advocate, teacher, doctor, parent—each and every citizen to help. Everyone must be prepared to contribute. I’m counting on you…just as I know you are counting on me. I’m proud to be your Governor. This entry was posted in Neil Abercrombie on January 25, 2011 by Maui Democrats. This entry was posted in Neil Abercrombie on October 22, 2010 by Maui Democrats. This entry was posted in Neil Abercrombie on October 21, 2010 by Maui Democrats. 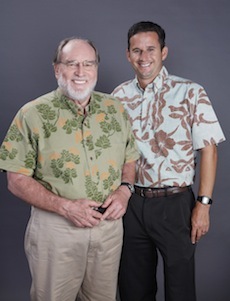 Since the Primary Election, we have joined forces with our running mate, Neil Abercrombie. Together, we have the ability to break the stalemate in government so it can serve the people again. And Neil understands that we cannot afford to have a Lieutenant Governor who sits on the sidelines. We have outlined major responsibilities for the LG in the new administration. Neil and I have been working tirelessly to share our vision for the future of Hawaii–and how we will implement our vision beginning on the first day in office. While our opponents put so much energy into explaining what is not possible and what cannot be done, Neil and I are talking about what we can accomplish if we work together. In these final days of the campaign, the choice for voters is a clear one. We can continue the last eight years of a state government paralyzed by division and argument. Or we can move in a new direction, with leadership that listens and takes action. The campaign for Governor is going down to the wire. The Republican Party will do and say anything to keep the Governor’s seat in Hawaii. All you have to do is watch a few minutes of television these days to see how mainland Republican interests are spending nearly $1 million on slick advertisements to attack Neil. I’m counting on you to vote. And please make sure your friends and family have their votes counted too. One by one, friend to friend, person to person, we will be victorious on November 2nd. This entry was posted in 2010 Lt. Gov Race, Neil Abercrombie on October 20, 2010 by Maui Democrats.